And now for something completely different: zombie prep! G’head, play with it! Christopher Ingraham is a genius. GENIUS I SAY. Ingraham’s article also has links to cool stuff like Cornell’s research model of a zombie outbreak — with further details on that bit(e) of interactive coolness — as well as scads of info on the items he decided were integral to surviving a Zombalypse. Yeah, that word is growing on me. Low population density: obviously important; less humans = less shufflers. Access to guns: not so much of a high point for me. I’m a crossbow/hammer gal. People with military experience: a double-edged sword; they could help, or they could subjugate, depending on the type of folks said vets are. So I left it low. Terrain that’s difficult for zombies to scale: MOS DEF. Though getting yourself & supplies back-n-forth would be tough. So I’d try for someplace tough to get to, but still has the ability to grow things. Places that can support fruit trees and grape vines especially welcome. Hello, gardentime! So…if anyone needs me once the shuffling begins? I’ma be in Montana. How about you? *Okay, you know the zombie apocalypse isn’t gonna happen, right? Breathe. 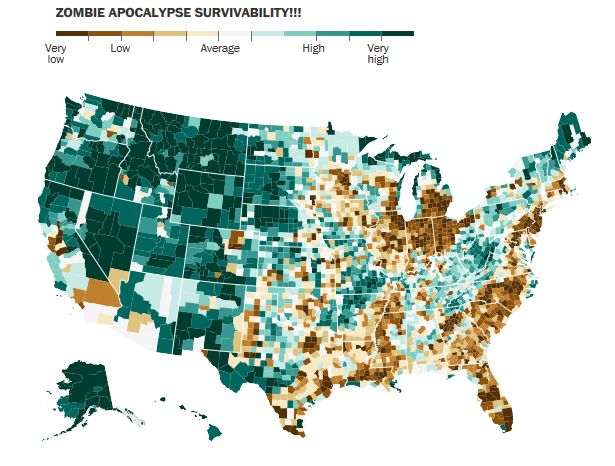 This entry was posted in 31 in 31 and tagged 31 in 31, The Washington Post, Zombie Survival. Bookmark the permalink.